Iain: Development and validation of a Hospital Frailty Risk Score focusing on older people in acute care settings using electronic hospital records: an observational study. Lucy’s music can be found here or you can follow here on twitter. 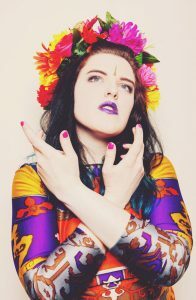 She has been very helpful to us and allowed us to play her music royalty free – so please have a look at her music and buy her albums! For some information about Alice have a look at this here and here is a photo of the lady herself. To understand the difficulty in diagnosing epilepsy in the older adult, due to the difficulties in getting a detailed history and the difference in presentation compared to younger patients. To know the common causes of epilepsy in the older adult. To be able to identify the seizure mimics in the older adult. To identify the risks in prescribing AEDs in the older adult.. Understand that epilepsy may have a large effect on the quality of life of an older adult. Epilepsy is diagnosed when someone has suffered more than 1 unprovoked seizures. At least 2 unprovoked seizures occurring more than 24 hours apart. 1 unprovoked seizure and a probability of further seizures similar to the general recurrence risk (at least 60%) after 2 unprovoked seizures, occurring over the next 10 years. With a progressive increase in life expectancy the elderly are the fastest growing segment of patients with epilepsy. The incidence of epilepsy rises from 90/100,000 per year in people aged 65-69 years, to 150/100,000 per year after the age of 80 years. Older patients most often have focal seizures. Auras and automatisms are less prominent, and the post ictal confusion tends to last longer compared to younger patients. Most common aetiology is cerebrovascular disease, but often the cause is never found. However despite this older adults have been shown to be referred less commonly to specialist epilepsy services than younger individuals. Then also interviewed the patients. and the length of time since onset. However, the patients interviewed did not report that patient difficulties accessing the hospital, patient reluctance to attend clinics, or the particular characteristics of older patients (knowledge, awareness, and willingness to ask for help) made it less likely that older adults would want to attend a specialist epilepsy clinic. Study of 572 surveys of older people from Australia, (100 with epilepsy). The main predictor of knowledge was clear information from a health professional. Older people with epilepsy need more information on their condition to facilitate better care management. Peterson CL. Older people and knowledge of epilepsy: GPs can help. Aust Fam Physician. 2017 Mar;46(3):132-136. Diagnosis in the elderly can be challenging. Mainly due to the difference in clinical presentation and aetiology compared to a younger person, co-morbidities, cognitive difficulties, and physiological changes which in turn affect pharmacological management. The diagnosis of epilepsy in adults should be established by a specialist medical practitioner with training and expertise in epilepsy. It may not be possible to make a definite diagnosis of epilepsy. Therefore referral is probably needed to a specialist. Think about cognitive impairment when taking a hx. It is not uncommon to under/over diagnose epilepsy in the elderly. An American study showed that the prevalence of epilepsy is higher among patients living in nursing homes than in the community dwelling elderly. They estimated that the prevalence of epilepsy may be at least 6% in this population. Non-epileptiform seizures (pseudoseizures are relatively uncommon in older people). Recurrent presentations of disabling events may point to a longer history. Focal seizures are more common than generalised seizures in the elderly. 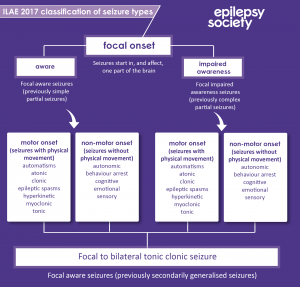 Clinical manifestations of focal seizures are different. An aura is less common and if present is often non-specific (e.g. dizziness). Automatisations are usually not present. Seizures may only present with a blank stare and impairment of consciousness. Review Special considerations in treating the elderly patient with epilepsy. Post ictal confusion tends to be prolonged in the elderly, lasting for hours and sometimes days to weeks. Clinical differences may be related to the anatomical origin of seizures which is more likely to be mesial temporal in younger patients and extra-temporal (especially frontal on the elderly. Primary generalised seizures may occur in the elderly. Absence seizures and status epilepticus are infrequent. Seizures can occur with infarcts, ICH and SAH. Haemeorrhagic strokes are more likely to be associated with seizures than infarcts. About one-third of patients with early one half of patients with late post-stroke seizures develop epilepsy. Epileptic seizures in thrombotic stroke. Sung CY, Chu NS J Neurol. 1990 Jun; 237(3):166-70. Predictors of seizures with ischaemic strokes include severity, large size, embolic cause and involvement of the cortex, hippocampus or multiple brain areas. (b) Dementia – Neurodegenerative diseases and dementia account for 10-20% of epilespy in the elderly. Patients with alzheimers have a ten fold higher risk of epilepsy and 10-22% of patients with alzheimers have epilepsy. (c) Trauma – head injury accounts for up to 20%of epilepsy in the elderly. (d) Brain Tumours – 10-30% of seizures in elderly. More likely in low grade slowly growing primary tumours. (f) Acute symptomatic seizures can arise from drugs, metabolic derangements, infection, acute stroke and head injury. Focus on key points again about the history – Key questions as above Detailed history – patient and if available an eye witness – as above. Think of differential diagnoses including – syncope, TIA, TGA, migraine, drug intoxication, infections, metabolic disturbance, sleep disorders, psychiatric disorders and dementia. If events are felt to be epileptic identify provoking factors and treat them. 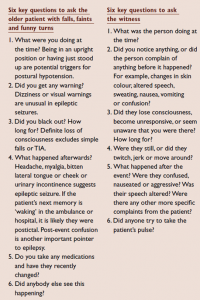 Unprovoked seizures – treatment depends on whether patient has had a single seizure or recurrent seizures (epilepsy). EEG – in conjunction are useful diagnostic tools. EEG – can be normal in about 5% of cases. Focal slowing or diffuse slowing activities are associated with a low risk of seizures. Focal spikes, periodic literalising, or periodic bilateral discharges are associated with high risk of seizures. MRI – best imaging modality. 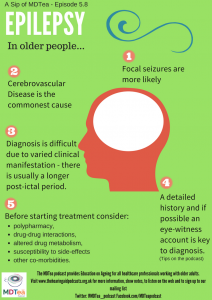 Treatment of seizures and epilepsy in older adults must take into account a variety of factors related to aging, including increased risk of polypharmacy and drug-drug interactions, altered drug metabolism, increased susceptibility to side effects, and multiple medical comorbidities. 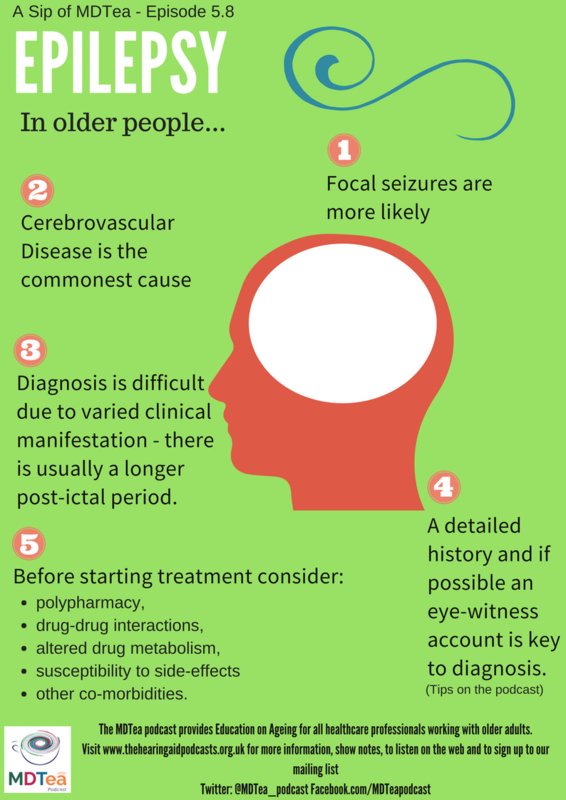 A seizure diagnosis has significant quality-of-life implications in older patients, who are already vulnerable to loss of independence, driving restrictions, impaired self-confidence, and risk of falls, which result in physical injury etc. Antiepileptic drugs are the mainstay of treatment. However, their use in older patients is complicated by several factors, including altered pharmacokinetics and increased risk for adverse effects and drug interactions. one review of 700 studies found an association between use of AEDs and risk of falls and recurrent falls in older people. A second study looked at two population-based, retrospective cohort studies in Ontario, Canada, between 2003 and 2015 using administrative health care databases of older adults. Older adults prescribed carbamazepine and V-P-T have a higher risk of being hospitalized with hyponatremia compared to other adults with similar indicators of baseline health who were not prescribed antiepileptic drugs. Ghandi et al. Antiepileptic drugs and hyponatremia in older adults: Two population-based cohort studies. Epilepsia. 2016 Dec;57(12):2067-2079. The availability of different drug formulations (liquids, crushable) may be important for patients with swallowing difficulties. In patients with impaired memory, compliance is higher with drugs that can be given once or twice a day. In other patients, however, use of several smaller doses over the day may minimize side effects. In one study, lamotrigine was as effective as and much better tolerated than carbamazepine. Brodie et al Multicentre, double-blind, randomised comparison between lamotrigine and carbamazepine in elderly patients with newly diagnosed epilepsy. The UK Lamotrigine Elderly Study Group. Epilepsy Res. 1999 Oct;37(1):81-7. However, this difference was almost completely negated by substituting a controlled-release formulation for the standard formulation of carbamazepine using an identical study design. In the Veterans administration study, lamotrigine, gabapentin, and carbamazepine were compared using a randomised, double-blind design. Seizure control was similar among the treatment groups. Carbamazepine was significantly less well tolerated than the other two drugs. The relative maintenance doses of lamotrigine and gabapentin were lower than that of carbamazepine, but the use of a standard rather than a sustained-release formulation was probably the main reason for the differences in tolerability among the drugs. Discontinuation rates due to adverse events were 12% with lamotrigine, 22% with gabapentin, and 31% with carbamazepine. In general, sodium valproate and levetiracetam are favourable due to a number of factors e.g. no TDM required and better side effect profile. According to the few published statistics on this matter, elderly patients with epilepsy seem to have better outcomes with pharmacological treatment than younger patients with epilepsy. Treatment is usually lifelong as any causative factors provoking the development of epilepsy in old age are not likely to remit over the next few years of seizure freedom. Lobectomy – Less often performed in the elderly. Cardiovascular and other co-morbidities increase the risk of complications from surgery. Diagnosis of epilepsy has a significant impact on the person as well as their families/carers. Education and counselling directed at both the patient and their families/carers is important. This should be started with AEDs. Epilepsy specialist nurses play a vital role in education and counselling. 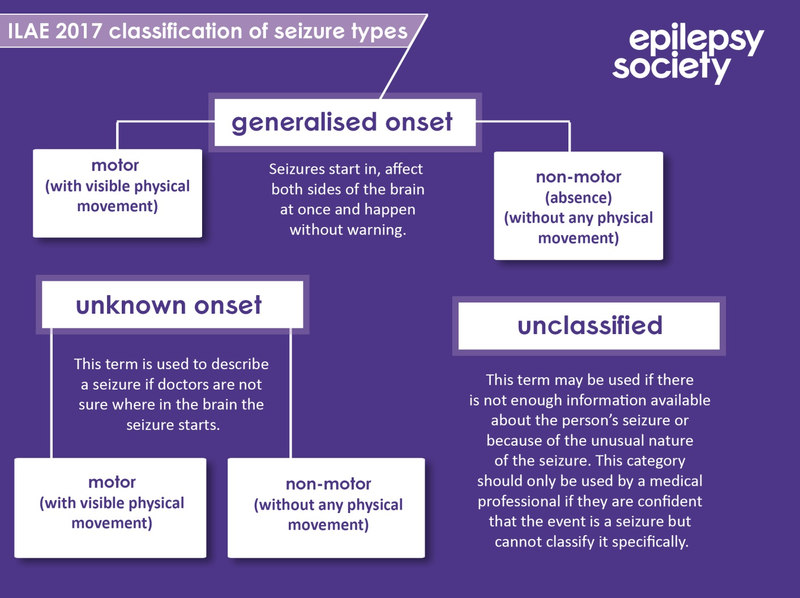 All patients diagnosed with epilepsy should be referred to them. British Epilepsy Association (BEA) in the UK = great support for patients and their families. 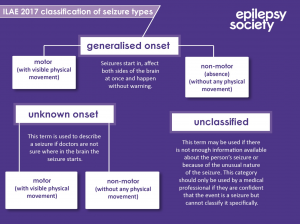 As well as a general physician, specialist opinion from neurologist may be needed if seizures do not respond to treatment or if the cause of seizures are not clear.